The memes are endless—Grumpy Cat, Nyan Cat, Keyboard Cat, Maru, and all the Lolcats. Last year even witnessed the first ever Internet Cat Video Festival at the Walker Art Museum in Minneapolis, with more than 10,000 people in attendance. Maybe it’s the culmination of living with domesticated kittens for thousands of years, or perhaps it’s due to an insidious epidemic of feline-hosted Toxoplasmosis. Regardless, we’re having a cat moment. And the cat-fatuated are no longer afraid to show their pride. 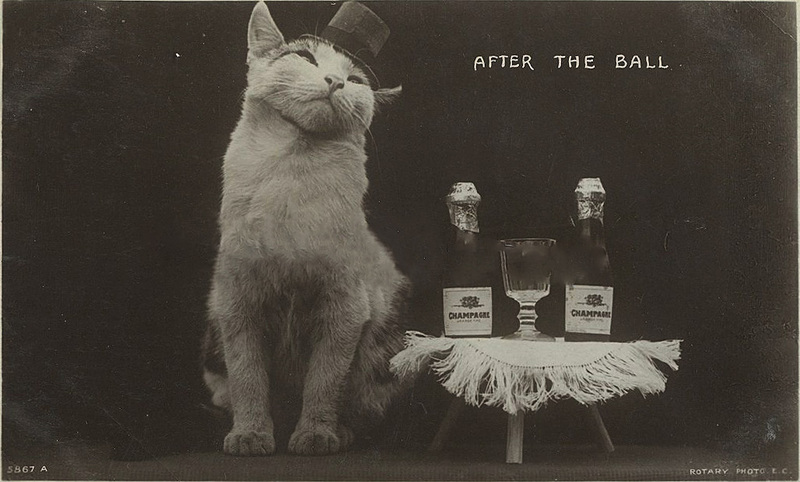 This online obsession is only the most recent incarnation of an age-old fancy for felines and the mysterious lives they lead. Historically, only certain types of people (sometimes pejoratively called “Crazy Cat Ladies,” though we’ve known them to be male-identified, too) lavished attention on their four-legged friends. But even Drew Barrymore once said, “If I die before my cat, I want a little of my ashes put in his food so I can live inside him.” As the glamorous actress makes clear, crazy cat people aren’t just losers and loners; they’re beautiful, likeable, and successful weirdos, too. 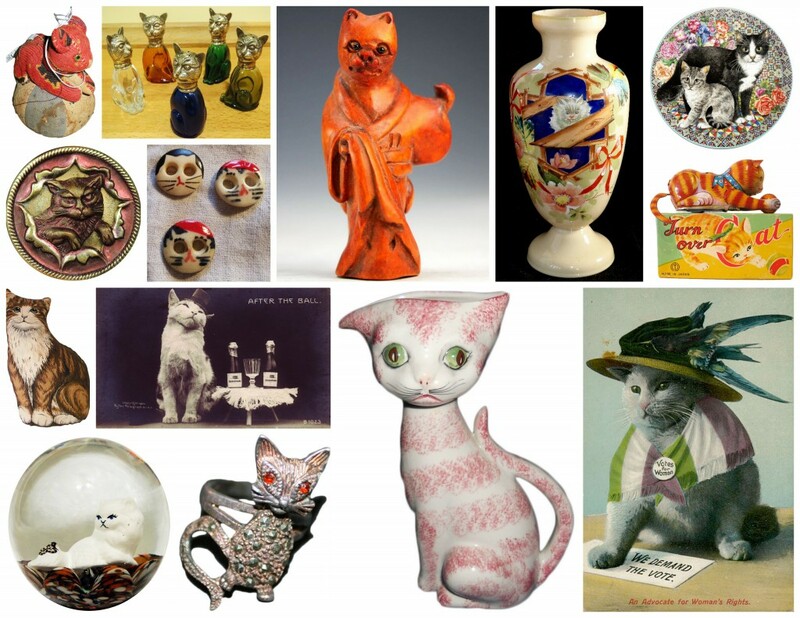 To celebrate the long heritage of all cat people, we’ve rounded up our favorite crazy-cat-person catlectibles on eBay right now. Grumpy cats indeed: These five stern-faced salt cellars are guaranteed to hypnotize your dinner party guests with their wide, unblinking eyes. Beware the kitten clones! 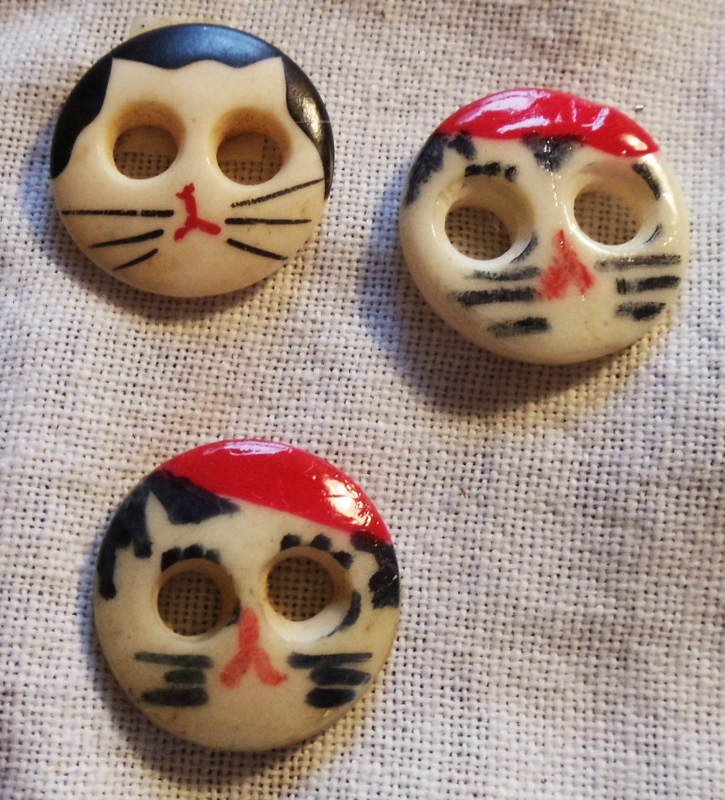 According to their seller, these antique cat-face buttons came off a set of children’s underwear (can we please call them pajamas, so it doesn’t sound so creepy?). Though their provenance isn’t verified, their cuteness and handcrafted quality makes them a double win. Plus they kinda look like empty-eyed cat skulls. 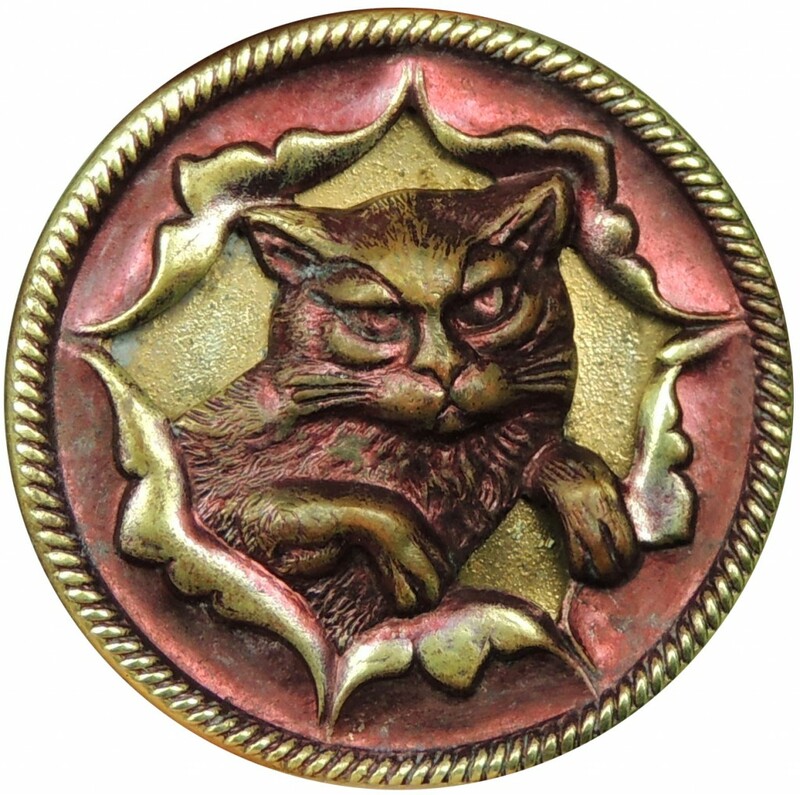 This brass button features a so-called “circus cat,” which is actually just a housecat being thrust through a circus hoop someone ripped open for him. And he looks totally annoyed. For the allergic, or those who wish to torture their own living felines, these wind-up cats are purrfect. It’s hard to say which is better, a helpful vacuuming cat or the playful “Turn Over” cat with his freaky, alien two-face. 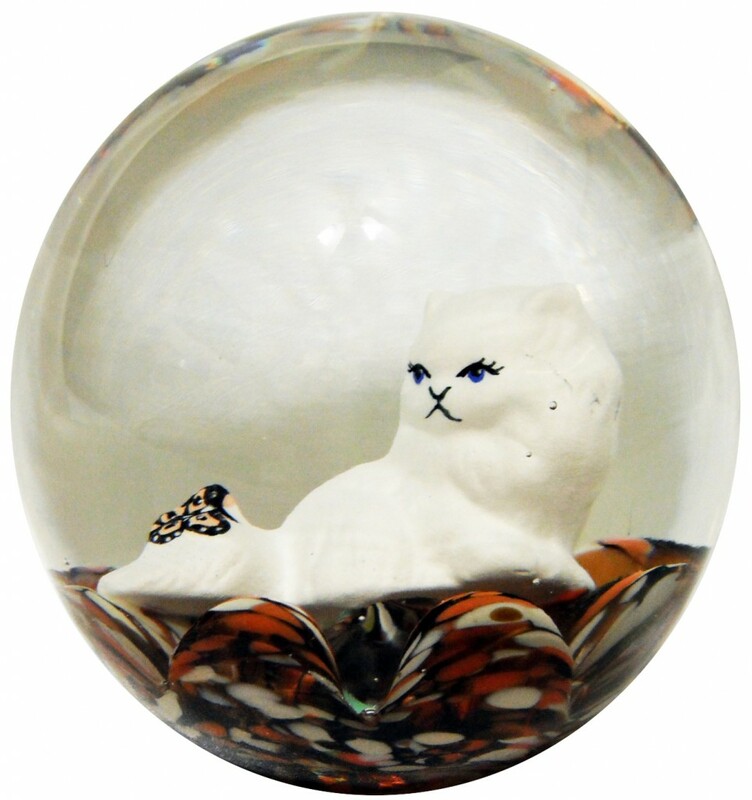 There’s something very familiar about this paperweight kitty’s smashed little face, like the stunted physical features of favorite Internet cat, Lil Bub. Hopefully, the inscription reading “Maude and Bob St. Clair” means this was some sort of love token, celebrating a shared feline passion. Remind me, which year is the fur anniversary? You can just hear this little Yoda-cat purring words of wisdom out of his old man face. 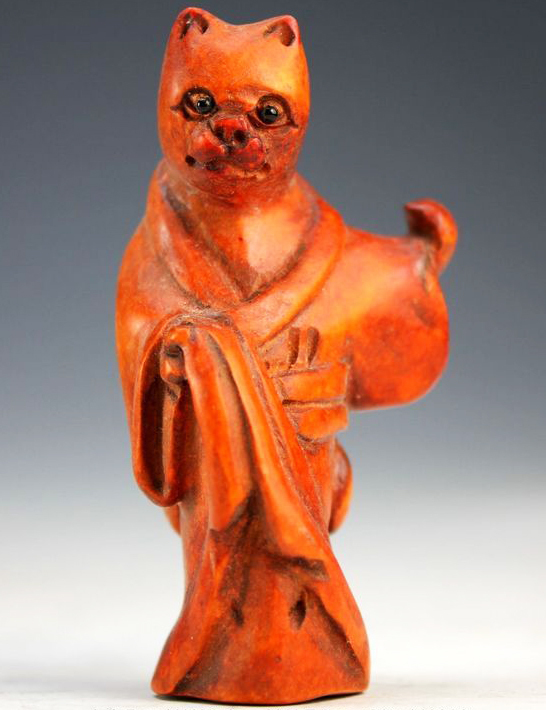 No doubt this netsuke piece would look fab on your cat-covered kimono. 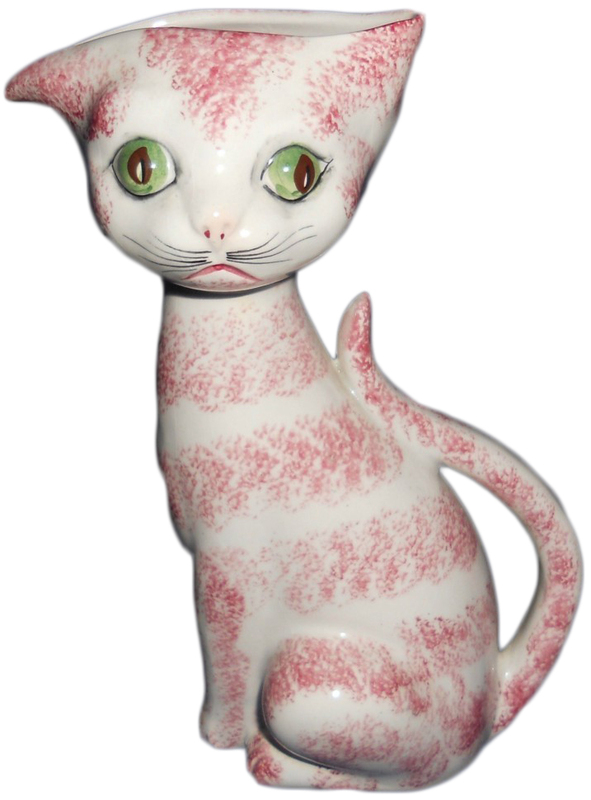 Somehow, putting cats on “bone china” seems only fitting. 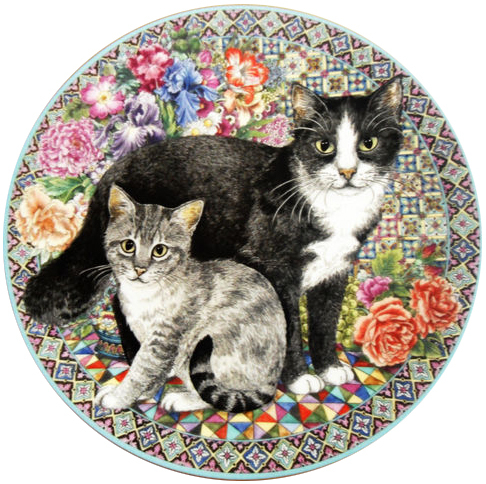 Try serving your friends on this cat-ware with a face half as serious as these two somber felines. Votes for lady cats! 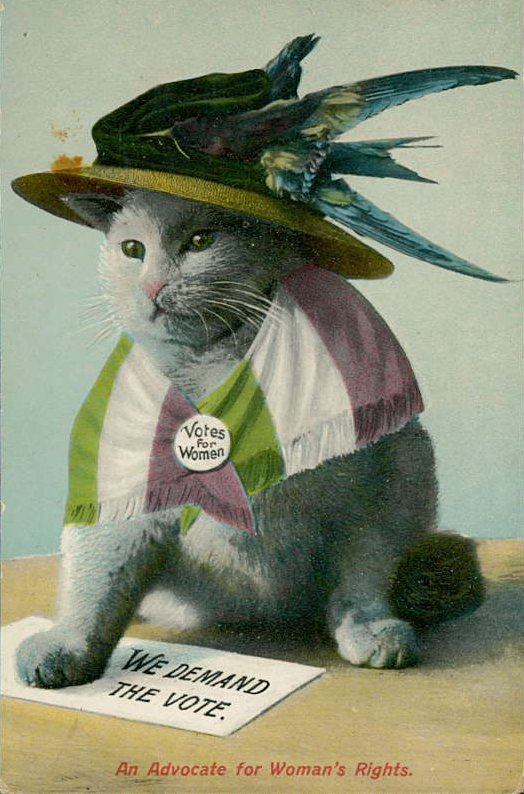 Though actually a rather repressive, misogynist take on the Suffragette, today this postcard is pure LOLZ. 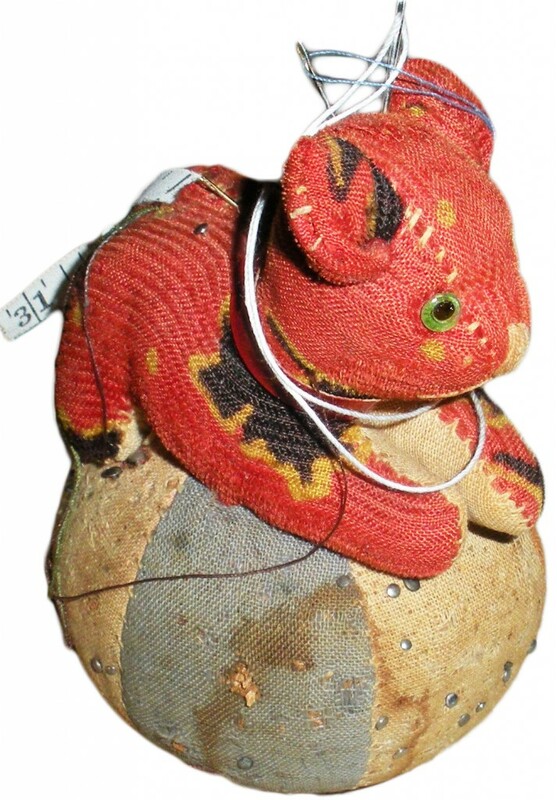 This little pincushion might actually be best for the cat-haters: Think of all the fun you could have sticking sharp needles into that cute face! Leaves, ribbons, flowers, and a satanic fluffball popping out of a boarded-up window. Pure genius, thanks to a porcelain-painting artist of yore. 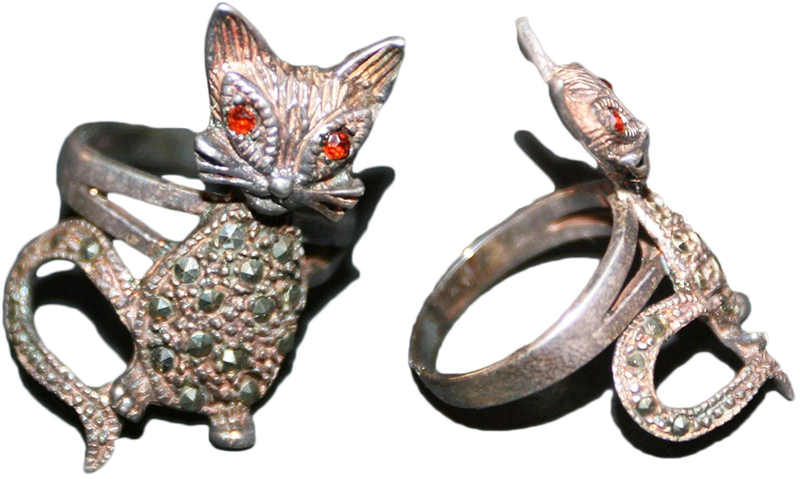 Rhinestone zombie-devil-cat ring! Wearing this little gem makes you feel simultaneously like a member of the Pink Ladies and a pagan tribe of Freyja worshipers. Come on, it was the ’70s: We were one with the earth, embracing every creature of the animal kingdom, while also wearing all-synthetic fabrics. 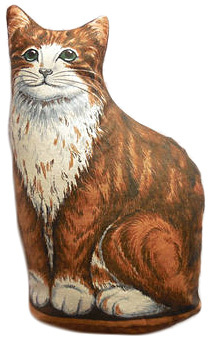 Hence this tasteful, DIY cat pillow. As the seller notes, “Cat is pre-owned but in good condition, with no stains, holes, and rips.” Thank you, cat goddess. Dr. Seuss, the Mad Hatter: A Peek Inside His Secret Closet Laika and Her Comrades: The Soviet Space Dogs Who Took Giant Leaps for MankindWho Killed American Kitsch? Although I was not mentioned in the opening paragraph of this article (a sad oversight on the part of the author), it was an enjoyable read. Love your articles Hunter. This site is amazing, and the members are like one big family-well most of them:). As you know from my little Gumption post there are a lot of cat people on CW. Thanks for allowing us to share each others treasures. Love it! 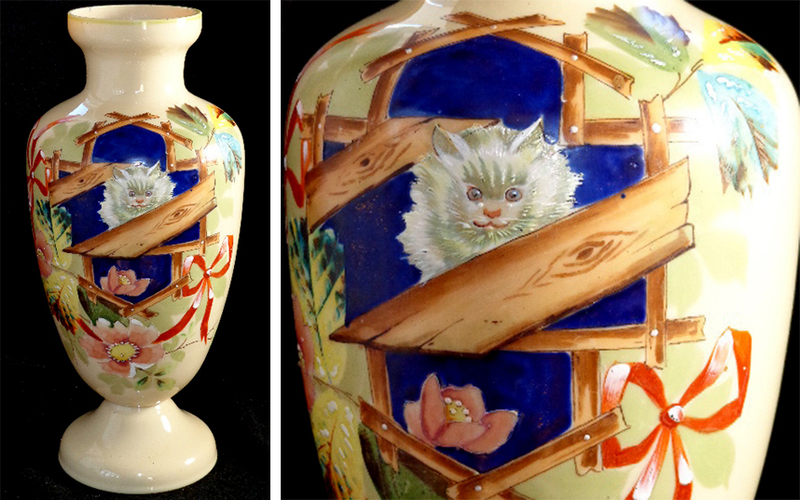 I can’t pick my favorite, though the cat vase has a derpy charm I find winning. I enjoyed this article very much & just posted my own musical band of ‘spagetti cats’ to Show & Tell. 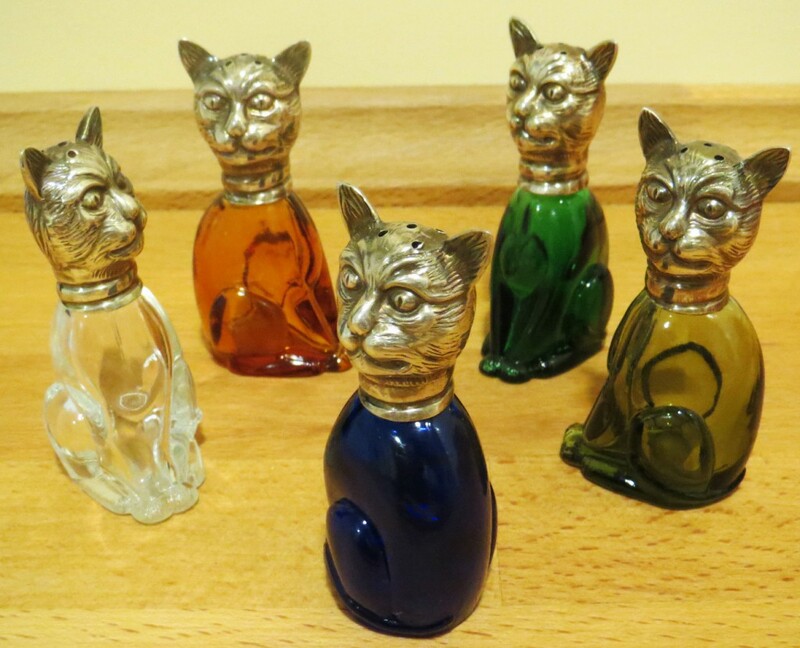 Thank you for sharing these beautiful collectible kitties! I have a green and dark blue yawning cat. Some kind of decanter bottle. The head comes off. Has a very long neck. I can’t seem to find one like it on the net. Did find a tobacco decanter that look like it as far as glaze and face. Mine is marked germany on the bottom. Have any idea what it was used for. “ ” If you’re looking through a box and there’s Pink Floyd and Led Zeppelin for 50 cents each, you can’t say no.